Modelling is the most important method of cognition. Without it we can’t imagine the modern science and education. It had stopped to be the thing just for scientists and researches. Modelling had escaped form laboratories of scientific institutions and had become widespread. Oil and gas industry has very big amount of different models, simulators and specialized software. One thing has remained unchanged: modeling has not ceased to be a sophisticated tool that requires in-depth knowledge. Before the era of total numerical 3D modeling there was a system of engineering models (methods of VNIIneft, Hiprovostokneft, TatNIPIneft, AzNIPIneft, etc. ), which was not too particular about the quality and volume of raw data, took into account the stochastic distribution of reservoir properties and had a good forecasting potential. Currently, it is almost completely forgotten, despite that current programs and techniques are not fully compensate the capabilities of engineering approaches. For example, the problem of taking into account the loss of oil due to discontinuity formation remains open. In our opinion, industrial science unreasonably easily refused simple engineering methods, putting too much hope on the multifunction simulators. Measurable improvements in the quality of forecasting solutions in the project documents due to the transition to 3D numerical simulation didn’t happened, rather, it went down. We, maintaining continuity of modeling techniques, use the arsenal of modeling tools, which creates the most adequate representation of the object. Including well-established engineering practice of previous years. We pay great attention to the creation of optimization technologies of system of wells arrangement. Why are we doing this? First, because the problem of deformation of wells arrangement in high recovery of reserves is becoming more global. Second, even undeformed well coverage is far enough from optimal variants with respect to reservoir heterogeneities. Third, it’s just a cheap technology. Forth, it’s a systematic technology, and thus effect of its implementation can surpass all expectations. 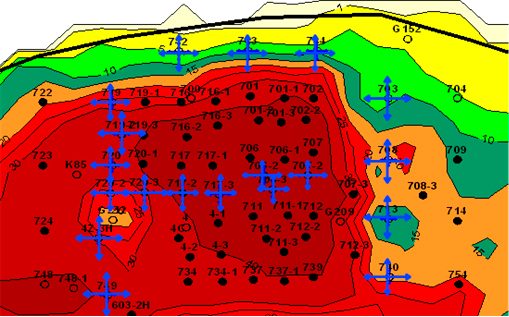 Direction of optimization of well placement in a zonal heterogeneity of the reservoir is composed of two technologies. The first based on on the numerical simulation and optimal control theory. The second had developed by using a simplified analytical approach applies to the category of “quick decisions”. Both technologies complement each other and can effectively solve the problem of optimizing the system design regardless of the degree of development of reserves. Significant theoretical developments and experience in analysis of real objects allowed us to create unique technologies and automated optimization algorithms of placement of wells, which open up possibilities of systematic stimulation on reservoirs, which can increase efficiency of flooding in different types of heterogeneities: lithofacies, tectonic, structurally gravitational. We also pay enough attention to geological and engineering operations on wells. Despite that this direction is named by our company as Local solutions, the methods of analysis and forecasting of interventions, which we use here, have a systemic character. They can be divided into two blocks: expert system and system with learning from experience. Expert systems are used when you need implement technology, which previously was not used here. And there are well established methods of selection of wells, based on the theory of fuzzy sets. Oil and gas companies have accumulated vast experience in implementing various interventions. This array of information contains a lot of useful and important knowledge that can significantly increase the success of interventions. We managed to pick up the key to this valuable knowledge through the use of machine learning methods. Preference was given to simple and transparent algorithms: Kohonen self-organizing maps, trees of decision rules. Technology of analysis and forecasting with decision trees, developed by our company, was considered at the special meeting Rosnedra (protocol #4752 from 13.12.2009), where it has received approval and recommendation for use to subsoil users and project organization. Currently, the main task of the oil industry is to reduce the cost of oil production. In the reservoirs, which characterized by high water cut, the use of most types of technologies related to the use of viscoelasticity polymers, often do not justify the money spent on interventions. However, there are low-cost, no deservedly forgotten, technology of hydrodynamic impact on heterogeneous permeability reservoirs. We are talking about the technology of unsteady flooding, including time-dependent (cyclic) flooding, change in the direction of filtration flows, periodic work of producing and injection wells in antiphase, cyclic exploitation of producing wells. Experience in the implementation of technology of unsteady action shows that during the period of implementation water cut reduces, oil flowrate increases, water production reduces. Magnitude of the effect of the use of non-stationary flooding depending on the permeability inhomogeneity, the ratio of the fluids viscosity, initial water cut, can reach 10-15% of the accumulated oil production over the period of application. Classical technology of cyclic impact assumes the flooded area high permeability reservoir (it can be reservoir layer, developed system of cracks, etc), which has the largest area of contact with the not produced yet oil-saturated part of reservoir. Knowing the characteristics of the high permeability zones and believing that at high water cut of producing wells the high permeability zone is flooded, we can determine the period of unsteady action. Company «CONCORD» has big experience of design technology of non-stationary flooding in various fields in Russia and Kazakhstan. The company’s employees were actively involved in the development of technologies in the fields of unsteady effects of Tatarstan (Romashkino Field: Abdrahman, Chishmin, East Suleev, Minibay squares, deposits 301, 303), Perm Krai (Shumov field), Orenburg Oblast (Rostashkin field), Samotlor field. In recent years, the company has pioneered the technology of non-stationary flooding in the fields of Kazakhstan (Kumkol, North Buzachi). In North Buzachi field the efficiency has been proven in field conditions. Thus, only one of the sections of the application of non-stationary flooding in 2013 was additionally produced 21.2 thousand tons, which is about 21% of the accumulated oil withdrawal site for the same period. In Kumkol in 2013-2014 this technology was directed to reducing pace of water cut. The effect of the application of technology in 2013 amounted to more than 7 tons of additional oil (about 9% of the accumulated selections of oil over the same period), in 2014 – more than 6 tons (about 11% of the total oil production site in the the period under review). Thus, in a period of declining world oil prices the active use of low-cost technologies of unsteady effects on oil-saturated reservoirs will allow significantly reduce the cost of oil. Despite the fact that our team is completed by truly professionals in its fields, we always seek opportunities to make it more stronger. Our company is at the forefront of knowledge in oil and gas field. Thus we have many interesting scientific articles.